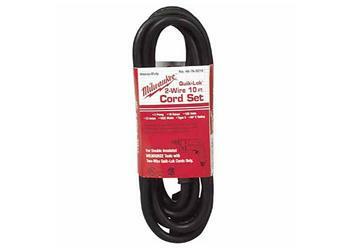 This Milwaukee QUIK-LOK® cord is a two wire double insulated 10 foot cord for fast field replacement of a damaged cord. Made of premium grade Hi-Flex wire the cord is quickly removed and attached to Milwaukee tools with the QUIK-LOK® cord feature. To change a damaged cord simply turn the collar at the top of the cord counter clockwise to loosen the nut and pull down on the cord to remove. To re-attach a new cord, line up the pins in the end of the tool with the pin receptacles in the end of the cord, push together and turn the collar clockwise to lock in place. Cord has a 1-15P NEMA type plug.